BSC offers endless options for warehouse storage and material handling that can reduce operational costs and maximize space and efficiency. Pallet rack systems, in which pallets packed with materials are placed directly on racks, are the most common storage racks. Pallet racks allow inventory and other supplies to be put in storage directly from transportation. We partner with the largest pallet racking manufacturers in North America and offer everything from cost-effective, 100% selective pallet racking to a variety of high-density pallet racking systems. Whatever the storage need, BSC can design a practical and economical solution. Our pallet racking clients include industrial and retail warehouses and distribution centers, manufacturing facilities and assembly operations, and companies focusing on chemicals, energy and utilities, and pharmaceutical manufacturing or distribution. Roll-formed, 100% selective pallet rack systems, in which pallets of goods are loaded directly onto the racks by a forklift, is the most common form of storage racks for warehouses and manufacturing facilities that store a wide variety of items. In our pallet racks featuring roll-form column design, each upright frame is fully welded using heavy-duty bracing and base plates to ensure structural integrity. BSC offers a wide assortment of vertical columns and beam profiles of various sizes to provide you with the most efficient solutions possible. All pallet rack uprights, rack beams, and support components are engineered to maximize load capacity. Industrial wire mesh decking solutions help improve the safety of various pallet rack systems. The high strength steel construction provides an ideal surface for varying sizes of loads. Wire decking is simple to install, low maintenance, and more durable than wood. Customization is at the heart of BSC’s pallet racking solutions. Our strong and durable racking can be configured in endless ways to suit a facility’s particular needs. Any storage requirement can be accommodated, and the racking system can be expanded as your needs increase. Our selective racks come in many sizes and are available in both slotted and teardrop column design. We offer a diverse range of accessories that allow you to customize your racking system and store virtually any load. Selective pallet racking provides easy, direct access to every pallet that’s in storage and allows for space so more than one forklift can operate in an aisle. It offers the lowest cost per square meter of racking and minimizes lower pallet handling costs because standard forklifts can be used. There’s no need for specialized lifts or trucks. Selective pallet racking allows for straightforward inventory management, permitting access to an extensive range of SKUs in a simple yet versatile system that’s easy to maintain and grow. The racks can be adapted to virtually any space or any product volume or weight. This type of storage can also integrate hand-stack shelving. Selective pallet racking is only one pallet deep and is configured with a maximum of two racks placed back to back. This arrangement means it’s a First In First Out (FIFO) type of inventory management. The stock that is stored first is also removed first, making it ideal for products that are perishable or do not have a long shelf life. If you’re storing a large volume of inventory, 100% selective pallet racking requires a relatively large amount of warehouse floor space. In that case, high-density pallet racking may be ideal for increasing storage. High-density racking systems can increase storage space by 75%, maximizing storage space and minimizing storage costs. They are ideal for businesses with high order and distribution volumes or high operating costs, or for operations that require storage in coolers or freezers. Any business challenged by demands for space, inefficient storage, and high building costs should consider a high-density pallet racking as a solution. Many options are available to suit particular needs. 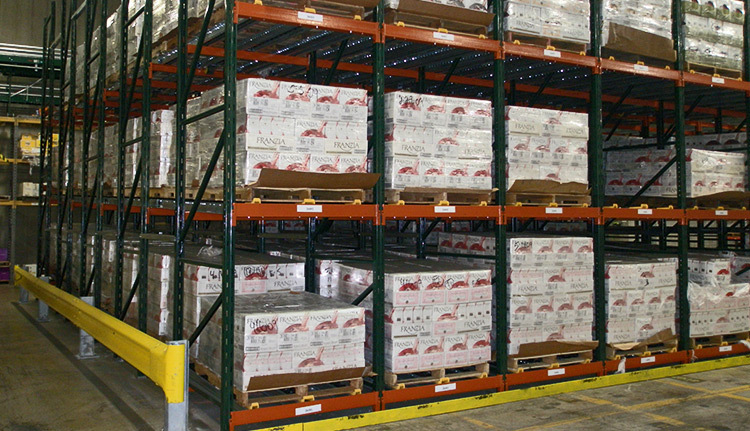 Gravity flow racks use gravity and a downward slope to load pallets for FIFO inventory management. When the front pallet is retrieved, pallets behind it will roll forward to take its place. This non-powered system is cost-effective and very efficient. 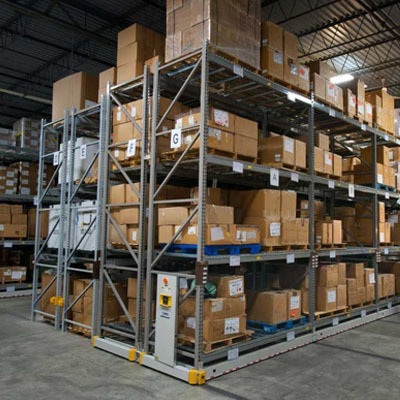 Drive-in pallet racks are best suited for storage of large quantities and few product types. They work well with a Last In First Out (LIFO) inventory management system. Inventory is stored several pallets deep, and the forklift drives right into the structure to store or retrieve items, eliminating the need for traffic aisles. Pallets can be arranged wall-to-wall and floor-to-ceiling. Push-back racking is another LIFO system. It utilizes a cart-on-rail system to allow deeper pallets to advance automatically when the front pallet is retrieved. Push back systems combine pallet accessibility with high-density storage in a way that’s similar to drive-in pallet racking. When items don’t fit on traditional selective pallet racking, we offer alternative solutions. Our specialized racking systems are designed to store items of unique shapes and sizes such as reels, lumber, pipes, casting dies, and large or extremely heavy objects. Our pallet rack safety and security systems help achieve an organization’s number one priority: protecting personnel and preventing injury. When pallet rack systems are used to store unsecured items, there is a risk that things will be jarred loose from the racking or stacks will topple in the case of accidental impact. Our safety systems work with your storage racks to prevent injuries as well as losses due to damaged inventory and equipment. Pallet racking systems are ideal for almost any type of warehouse storage situation, and BSC offers customization and specialized solutions to fit even the most particular needs. We enjoy collaborating with our clients to design custom systems that will reduce costs and maximize the efficient use of space. Contact us today to discover the ideal solution for your warehouse.